Marketing Master Profile for Econsultancy.com. What’s This? I discover new marketing experts to follow in a variety of ways. Sometimes through roundups of experts. Sometimes through recommendations via someone I already follow. And sometimes because I’m really trying to do some deep research on some topic. 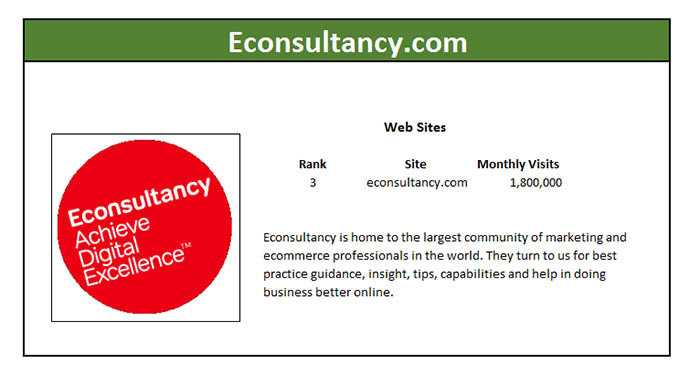 I started following econsultancy.com’s blog because it kept coming up in my research on various topics. It’s the quintessential hive mind or community of marketers. As such, it is quite different from the many individual marketers like Neil Patel. Rather, it is an eclectic combination of the thoughts and writings of its many contributors. This is its strength and gives it a strong flavor that is evident when we compare its analytics to the overall Top 15 Averages. Monthly visits is a very healthy 1.8 million. They have a following! In terms of style, Econsultancy relies more heavily than the Top15 on search traffic. That’s not surprising as it is osmotic. That is, if you produce enough content, the search traffic will come, whereas other kinds of traffic require focused efforts to bring forth. The articles on econsultancy.com are typically a bit short, which explains why their content quality metrics are all a bit under the Top 15 Averages. In terms of SEO Efficiency, EConsultancy has a very high Domain Authority of 70 versus the average of 66. They have a very large number of backlinks–1,800,000, but they’re dispersed. With so many backlinks, their ability to Excel on a traffic per backlink or other backlink quality metric is limited. Likewise, EConsultancy has quite a lot of keywords they rank for, over 2x the Top 10 Average. This again reflects the diversity of the content to be found there. Social media, interestingly is not only a limited source of traffic but is unusually concentrated around Twitter and LinkedIn versus the normal Top 10 Averages. This reflects the very B2B nature of their audience.